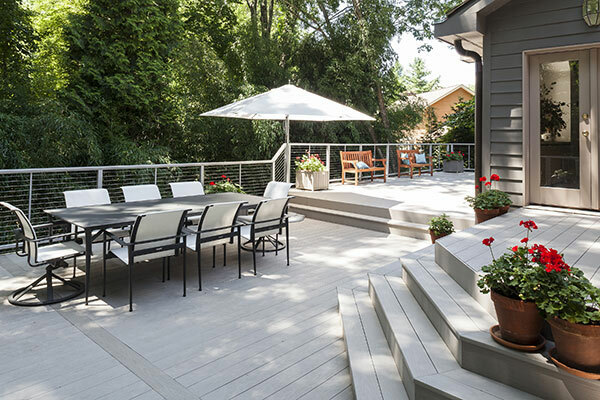 With over 15 years of experience building decks for Maryland residents, we take pride in our deck designs. T.W. Ellis is committed to a creating a deck that you will enjoy for many years to come. Several of our outdoor spaces, including custom decks and porches, have achieved awards such as the Awards of Excellence with Home Builders Association of Maryland. We have experience using several types of high quality deck products including pressure treated wood and exotic woods as well as low maintenance composite decking. Plus our quality craftsmanship and attention to detail guarantees you will love the completed project. Adding a patios, landscaping, deck and pathway lighting packages, and an under-deck drainage system can provide the beautiful finishing touches to your custom deck. T.W. Ellis has achieved many certifications including Certified Master Deck Builder and LEED Accredited Professional. Everyone at T.W. Ellis understands the importance of continuing our education and maintaining current certifications, to provide you with the most knowledge possible. Tim Ellis is an active part of several industry organizations including Home Builders Association of Maryland, North American Deck and Railing Association (National member and past Local Chapter Vice President) and the American Society of Professional Estimators. Next time you are thinking of building a deck, call T.W Ellis, LLC for all your outdoor needs! We also build covered porches, screen rooms, additions and sun rooms. Call today for a free estimate! T.W. Ellis knows how to do outdoor living space...from design, to construction, to the professional staff...they have provided us with an outdoor extension of our home that we will love and use for many many years. We highly recommend them! From the initial email send on-line to the project completion, T. W. Ellis was prompt, courteous and a pleasure to do business with. It is rare to find competent businesses/companies these days from start to finish and from the owner to the tradesmen. This company provided a service that seemed as though we hired close relatives to perform our build! Nothing I can put in words could describe how happy we are with T. W. Ellis, so I guess I will let my deck speak for itself!! Good website showing work completed. Job was completed in a timely manner and very professionally from start to finish.